UPDATE: Gator found on the side of the road near East Baton Rouge was taken and harvested legally, according to the Louisiana Department of Wildlife and Fisheries. The harvester told authorities the gator crawled up on the bank and died after swallowing the hook set the evening before. Louisiana Department of Wildlife and Fisheries said usually the gators will stay alive until hunters check their hooks in the morning, but because this one was dead for so long the harvester could not sell it. The person was issued a citation for intentional littering and must retrieve the alligator and properly dispose of it. 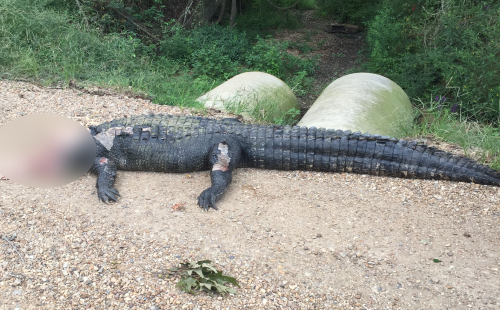 ZACHARY - Wildlife and Fisheries officials are investigating after an alligator roughly 11 feet in length was found headless on a gravel road near the East Baton Rouge Parish line. Photos sent in by a WBRZ viewer Friday evening show the body of the massive animal lying in the middle of Brian Road in Zachary. The man said the gator's head appeared to have been "carved up" and removed, leaving only some of the skin and tongue behind. The Louisiana Department of Wildlife and Fisheries is offering a $1,000 reward for information that leads to an arrest on this case. Anyone with information is urged to call the Louisiana Operation Game Thief hotline at 1-800-442-2588.